Iranian President Hassan Rouhani says Iran and Russia’s common interests have strengthened the two countries’ cooperation, saying Tehran and Moscow are determined to further improve ties. “The importance of Russia has increased in Iran’s regional and strategic relations and numerous meetings between the two countries’ officials are a proof of the consolidation of ties and the two sides’ determination to expand them,” Rouhani said in a meeting with his Russian counterpart, Vladimir Putin, in Astrakhan city on Monday. 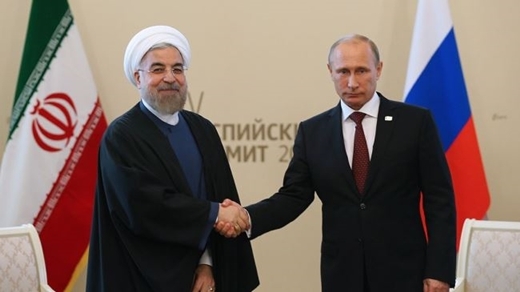 Rouhani added that he had held meetings with the Russian president four times over the past year and discussed bilateral, regional and international developments. The Russian president, for his part, said Tehran and Moscow share a common stance on many regional and international issues. He added that enhanced cooperation between the two countries has been an important factor behind stability in Central Asia and the Middle East. The Iranian president paid a two-day visit to Russia to attend the 4th summit of the Caspian Sea littoral states after he wrapped up his visit to New York where he attended the 69th annual session of the United Nations General Assembly.